I am so in love with NEBRASKA it may well be my favourite film of the festival to date, even above the stunningly beautiful GRAVITY. It's the kind of movie that makes you laugh, reminds you of your real life, gives you beautiful visuals, and when you leave you just want to call your dad and tell him you love him. So the story is one of an old man and his son reconnecting on a road trip. 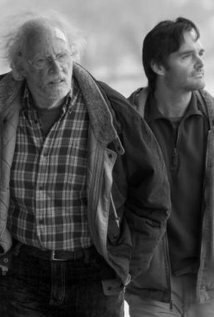 The old man is Woody Grant (Bruce Dern), an alcoholic with Alzheimer's who gets one of those publisher's scam letters and thinks he needs to go to Lincoln, Nebraska, to claim his million dollars. In act of frustration and desperation, his lovely son David (Will Forte) decides to take him and pander to his happy wishes. But en route, Woody has an accident and they end up detouring to his old home town of Hawthorne, where they catch up with his family and old friends - all of whom have stories about his past and apparently, claims on his newfound wealth. The movie is consistently laugh-out-loud funny - whether due to the blunt chastisements of Woody and his wife Kate (Jane Squibb) or the menacing idiocy of David's cousins, or the deadpan banter between the ageing brothers. There's even a brilliant moment of Coen Brothers-style goofball comedy when David and his brother Ross (Bob Odenkirk) decide to "liberate" a compressor that Ed Pegram (the deliciously menacing Stacy Keach) supposedly stole years ago. But what really elevates this film is the wonderful relationship between Woody and David, the evident care that even his badgering wife feels for him, and the touching portrait of a real family complete with inane conversations, petty grievances, and weary old stories. There were many moments in this film where I was close to tears and many more where I laughed out loud. Kudos to directer Alexander Payne (THE DESCENDENTS) and writer Bob Nelson for creating a dramedy so consistently engaging and funny and wise and to cinematographer Phedon Papamichael for his stunning widescreen black and white landscapes and family tableaux. You can listen to a podcast review of this film below, or subscribe to Bina007 Movie Reviews in iTunes. NEBRASKA is rated R in the USA and has a running time of 110 minutes. It played Cannes and London 2013. It opens in the USA on November 22nd; in the UK and Ireland on December 6th; in the Netherlands on December 19th; on February 6th in Argentina; on February 7th in Sweden; in Belgium on February 19th; and in Italy on February 20th.